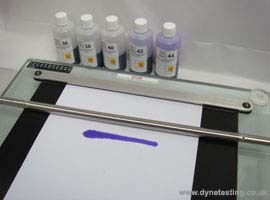 The “DyneX” Metering Rod applies a highly uniform wet film coating. These wire-wound metering rods, when used on a precision surface such as the “DyneX” Drawdown Platform, will apply a highly uniform wet film thickness, which is ideal for Dyne testing. The rods, widely known as Metering Rods, Mayer Rods or drawdown bars are fabricated from 303 stainless steel; the wire winding is 304 stainless steel. The 400mm long “Mayer” rod has 305mm of wire wound on centre. Rods are available in 6.3mm and 12.7mm diameters. 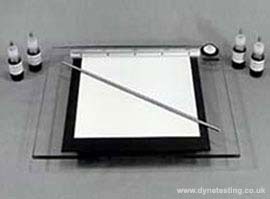 These lab rods or drawdown bars can be used either to test two coatings simultaneously, or for full width substrate evaluations using one test liquid. Economical and easy to use; simple clean-up with water, alcohol, appropriate solvent and low lint cloths. 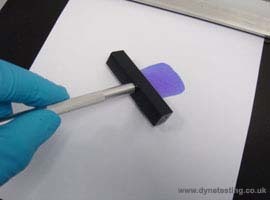 With the use of such non-abrasive cleaners, metering rods can be reused repeatedly.